The tooth is in the telling « John Bartram Lives! A preening turkey is an excellent symbol of this country's devotion to celebration of Thanksgiving. Ben despised the selection of the bald eagle as the symbol of our new United Colonies. 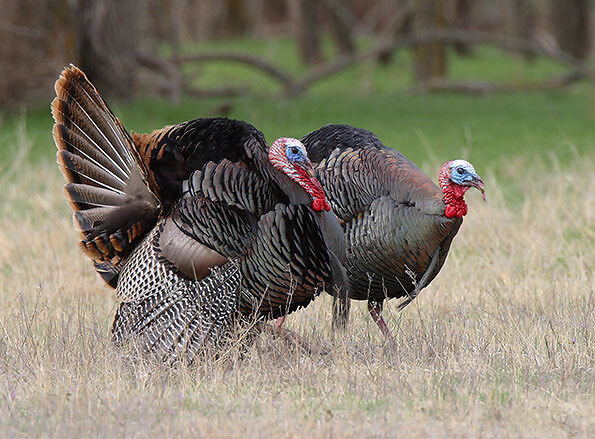 He would be entirely in favor of any holiday that takes as its symbol this preening native of our woodland habitats. It is Thanksgiving and this posting is delivered with all good wishes of the season. May the day be filled with joyous reunion of family and hearty repast of the seasonal bounty. It makes me think of many dinners past that were neither hearty or healthy. I love the opportunity that we have today to enjoy the safety and security of home with such a lofty standard of healthy environment. 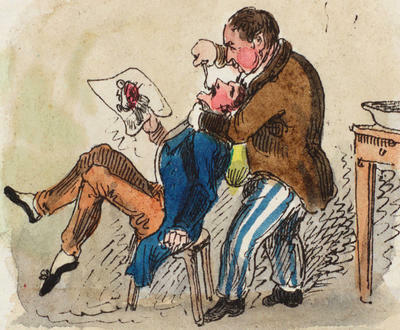 Dentistry and pain go together in 18th century society. I have never understood why the Olde Days are thought of as goode or romantic or quiete or simple or especially happy. I do not pine for the lack of internal domestic plumbing or external personal sanitation. Give me a warm bath, flush toilet, Franklin’s electricity, and most importantly: a mechanical toothbrush with dental floss. These modern conveniences are the most welcome addition to my Thanksgiving dinner! Dental hygiene is the single greatest addition to quality of life that I have lived to appreciate. In any crowd of people during the bloom of my youth, 80% would have had impaired and imperfect teeth. You have to have lived it to appreciate the appalling visual presentation of gap-smiled, puffed-cheeked, red-gummed, and pusty-sored orifices that would have greeted you. Many of you probably have heard the stories related to George Washington’s teeth. They are all mostly rumor and innuendo. They are tall tales manufactured of threads and half-truths. He had several sets of dentures. None of them were made of wood. One of them was even sculpted of Hippopotamus ivory carved to fit the curve of his gums. That set was manufactured by Dr. John Greenwood. Dr. John was an artist and proud of his scientific craft. 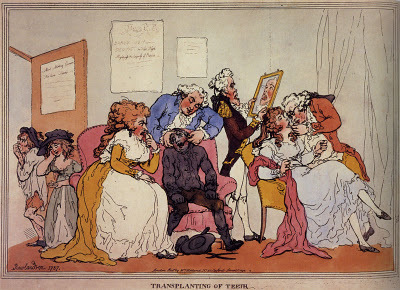 He practiced in the nascent industry of orthodonture. His teeth were mouths full of animal ivory, human teeth, springs, rivets, gold, and metal rods. Is it any wonder that none of Washington’s portraits show him smiling? 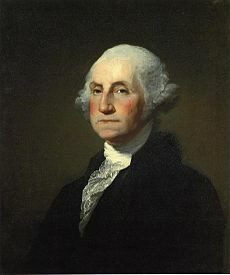 Whether he was in pain, padded with cotton wadding, upset over the mounting dental bills, or simply embarrassed, Washington never willingly showed his teeth or lack thereof. He had only one original tooth in his entire head. George Washington is always viewed very close-mouthed. Many supposed that was because he was boring, or secretive, or prudent. We are spoiled in this country. I now have a personal dental hygienist. Her name is Jenna McKenna. She is a bonnie lass who has difficulty understanding the man she attends in the chair. I am especially hard to hear with my mouth full of all the tools and torture devices of her trade. She laughs to humor me when I ask questions about my confusion over subjects that would be common place for a man of this day and time. I believe she thinks that I am funny when in point of fact I am an aberration, an eccentricity, a folly. Maintaining 300 year old teeth has become one of my prime directives. I must care for them or risk loosing them! Flossing has always been an issue. We used to use dried reeds. And toothpicks were an ever-present part of a traveling cosmetic set. Today I struggle mightily with the additional technology of vibrating toothbrushes, fluoride additives, aisles-ful of oral washes, powders, pastes and irradiation from x-rays. It is all very twenty-first century. So when I sit down to this year’s Thanksgiving dinner, I will take it in full measure of health and well-being. I will chew strongly and without pain. It is a pleasure to wish that you all experience the same. Even still today, people are forced to wait in anticipation of visiting the dentist in his lair. Although pain is not at the forefront of one's mind, a person would do well to care for his teeth rather than deal with the alternative. As your descendant I am also filled with the wanderlust for travel. On my next search in the Philadelphia area I will surely traipse down to the Garden. In the mean time I am off to New Zealand. Plants anyone?